After rain postponed the $10,000 Indiana Sired Fair Circuit (ISFC) Championships at the Elkhart County Fairgrounds Saturday, Oct. 6, the races were back on track Monday, Oct. 8 at the Jay County Fairgrounds in Portland, Ind. 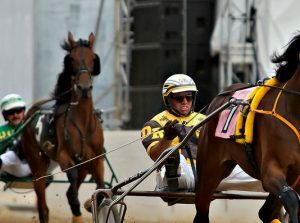 Of the eight championships, five were recorded under the 2:00 time barrier with Driver Jay Cross and Tim Gilliland each scoring two wins on the card. Cross and Gilliland teamed up for a win in the afternoon’s third race, the $10,000 ISFC Championship for two-year-old trotting colts and geldings. Kasha’s Boy and Don Eash went out for the early lead and put distance between them and the rest of the field for the first half. Around the final turn, the rest of the field began to tighten up on the leader with Mr Buckaroo and Jay Cross leading the charge first over. Jesse Popper and Doug Rideout followed their lead and in the stretch, it was a battle to the finish. Both Mr Buckaroo and Jesse Popper dug deep in the stretch for the win with Mr Buckaroo getting the edge by a neck at the finish line in 2:03.0. Florishing Future and Rocky Loney finished third. 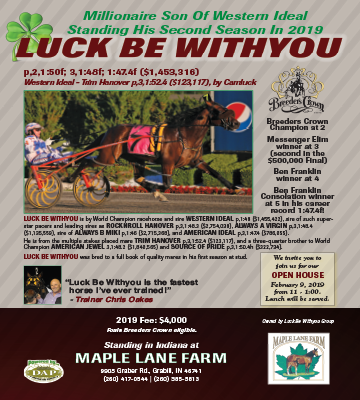 It was the fifth win of the year for Mr Buckaroo, who now has in excess of $15,000 in earnings for owners Patty and Nat Hill IV of Bloomington, Ind. The Mr Cantab gelding earned a new career best in the race. 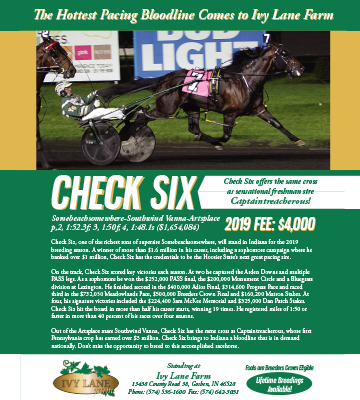 Cross was back in the winner’s circle for the $10,000 ISFC three-year-old colt and gelding pace as Hilltop Ginger put together a strong effort for the win in 1:58.0. Cross moved the Fred and Ginger gelding to the front by the halfway mark and never looked back, winning by one length over Wallyintheshade and Brad Ferguson for second while Woodside Banjo and Don Eash finished third. 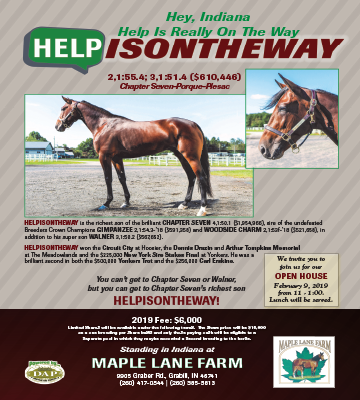 Owned by Debra Carsey, Maynard Miller and Sara Haynes, Hilltop Ginger earned his eighth win of the season and increased his career to more than $22,000, all of which has been earned this season as Hilltop Ginger was unraced at two. The afternoon closed out with another win for Gilliland in the $10,000 ISFC three-year-old filly trot. Gilliland prepared Jailhouse Buckaroo for a strong gate to wire effort, winning by two and three-quarter lengths with Doug Rideout in the bike. It marked the second win on the card for Rideout who also connected with Shes Cruising Home in the two-year-old filly pace. Jailhouse Buckaroo stopped the timer in 1:59.2, a new lifetime mark for the Hills. Credit Fraud and Cross finished second while J S Miss Lady and Alex Udell finished third. Gilliland, a native of Bloomington, Ind., is known for his expertise with trotters. 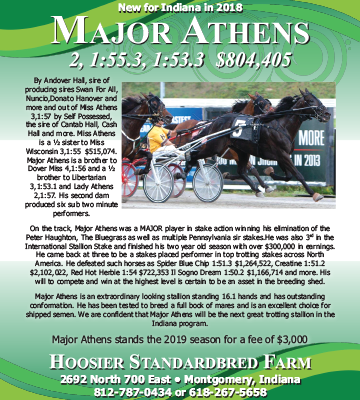 He has been training horses since 2003 and races primarily on the Indiana Fair Circuit. 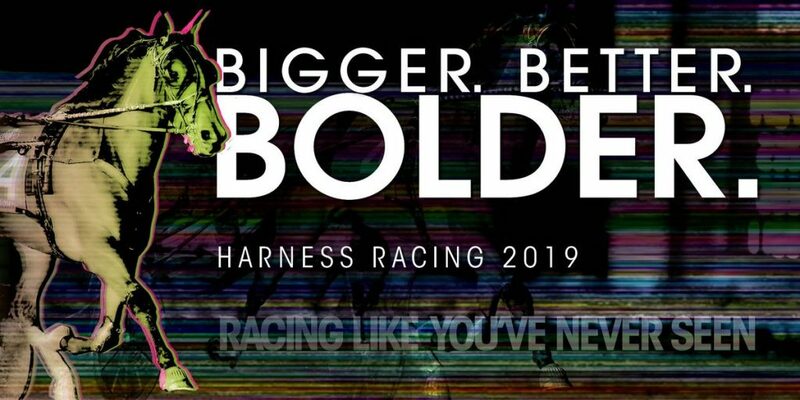 Cross has been involved in harness racing his entire life, following family members into the business after enjoying an early career in the Trottingbred industry. He has numerous leading driver titles to his credit and celebrated his 3,000th career victory last season.